Over the past century, farming steadily decreased to less than 2 percent of the U.S. population. But then, from 2002 to 2007, farms actually increased 4 percent, the increase being mostly small farmers. The number of organic farms increased from 12,000 to 18,200 in that same period. Reference: Brown, Lester (2009). Plan B: 4.0 – Mobilizing to save civilization. New York: Norton, 231. 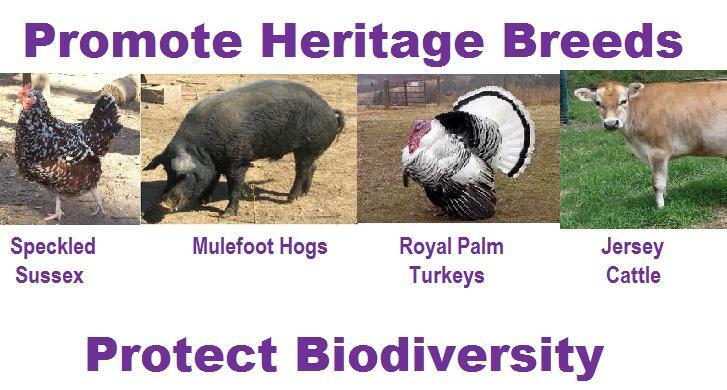 Diversify – “don’t put all your eggs in one basket!” If all the animals of one species were genetically the same (say, if all our turkeys were commercial whites…oh wait, they practically are!) then a blight came through and killed only that genetic pool…We would be in some serious trouble. A good present day example of why biodiversity is important is the problem with the invasive bug that showed up a few years ago, the Emerald Ash Borer. This bug has killed thousands of ash trees and may not be able to be stopped before every ash tree in America is dead. Some cities planted their trees as mainly ash trees. Now, those cities green spaces are decimated! Plant for variety and then only a small portion will be affected at any one time. Heritage breeds are often naturally disease resistant and better foragers (meaning cheaper to raise, although it may take a little longer). Purebred animals and plants breed true. Some commercial animals do not even have the ability to breed (such as commercial turkeys)! A HEALTHY field or garden is the first step toward a sustainable environment (therefore allowing for a balanced pest population). Mulch – bark, straw, hay, grass, etc. 3. End up with decomposed organic matter that is sustainable because it slowly releases nutrients which feeds your plants over a longer period of time and does not allow for runoff to carry the nutrients away as easily. Organic matter holds moisture, which will keep your crops thriving in times of drought. Also, organic matter increases the habitat for beneficial critters that will encourage microbial action and increase available nutrients even more! Plus, the HEALTHIER the soil, the LESS you will have to deal with harmful pests! Quote from: Kingsolver, Barbara; Hopp, Steven L.; Kingsolver, Camille. (2007). Animal, Vegetable, Miracle: A year of food life. New York: Harper Collins, 165. Integrated Pest Management (IPM) is the modern pest-control concept. Instead of spraying DDT on a lake for mosquito control just to have the mosquitos return the next season twice as bad, IPM encourages a diverse set of pest-control measures that result in long term, harmless control of pests along with sustainable practices for growing healthy products. dung flies (If you see these shiny yellowish flies that just don’t look like your normal housefly…and they are sitting on a cow pie…you have dung flies! Dung flies help decompose manure quickly (they are “living composters”) but due to chemical applications and concentrated animal operations, many dung fly/beetle populations are at risk of extinction. Do your part and let them live. They will do your fields a great favor! Can you add to my list? What has worked for YOU? I’m in a forum with other small farmers and one posted so others could see her “inputs” for the pigs she raised. She bought 600 pounds of grain per pig. Finished live weight was 225-250lb of pig, meaning about half that ends up being meat you take home to eat. [Basically input 600 pounds grain output 100 lb. meat] I told my husband what she had done and he said, “600 per pig, that’s got to be wrong”. Nope, I double checked. And it correlates about with what I spent as a kid on my silly 4-H pig projects (people support the kids by buying their pigs at a special auction, so I always came out ahead money wise…). My friend started feeding milk/cream that she got free from an organic company because it was nearing the sell by date. She cut her grain cost in half. Hmm, I thought…I’ve got cows and extra milk! Now I’ve learned that another friend raises her pigs on ONLY pasture, milk, and household food scraps. They grow just as well and “milk fed” meat is said to be much tastier. So, I plan to feed milk and clear our woods out, which is only partially pasture now. The pigs will clear it for “free” (versus using a chain saw) and they will get nutrition and turn the mismanaged land into productive, fertile land. They do good on skimmed milk (after I’ve taken the cream for butter) and whey (cheesemaking waste). And from the garden, they will eat whatever leftover plants that the chickens or cows won’t eat. We do NOT compost our plant material from the garden back into the garden because of pest control concerns. I just get so excited that I can go away from buying 600 lb. grain (no offense grain, but you’re too rich $$ for me!) to raising the same product on what it costs me to feed the cow (milk) and a new solar electric fencer (because I don’t have one). Everything else is already on the farm! I will be sure to let you know what my costs end up being (fixed and otherwise) and how the meat tastes! by example and show what one is doing to have a better relation with our environment..
Our pigs find the cow patties each time they move in the field, because the cows have the whole field and the pigs just a square within it that we move. They are extremely happy the first few days after a move, with all the new “stuff” to eat. You are correct, there are many ways to go about composting and being sustainable. 🙂 Always fun to hear what people are doing! my hen was sitting but all of a sudden stopped yesterday. she was sitting in our little pink chicken tractor. i had looked forward to baby turkey’s following her around but i guess not now. i am getting 5 of the rare heritage breed jersey buff turkeys from sand hill sometime in july and have also got 5 american buff geese arriving in july. so lots of natural bug predators for the farm on the way. have you had geese? i have enjoyed different blog stories on the geese and look forward to having ours. I’ve heard geese can be mean, and the ones I met were… Same with the ducks. They would pick on my chickens. Let me know how your geese go, maybe they’ll be nicer! Yes, the larger birds are great for that! 🙂 Our Royal Palm turkeys are just getting ready to start setting on their eggs, so we hope to have babies soon. That’ll make for lots of mouths this fall when the stink bugs come out! With IPM, you also have to consider the entertainment factor. I know a redneck farmer (ahem) who is forever expounding on the joys of watching (and listening to) the bug zapper. The same said farmer is positively convinced that using the bug zapper in the orchard area has cleared up the problem with Coddling moths. I believe him, since the little buggers are gone now! Then we have the birds riding on the horse’s back, the chickens scratching in the horse/cow manure in the field (thus “spreading” it for us!) and eating the grain or other yummy tidbits found in it. How about the pet and wild animal food? We throw a lot of our “compost” out in the field and have literally had stampedes of cats, dogs, chickens, and the horse all challenging one another for all those treats (and, when we’re not visible, the deer & wild turkeys). Did I just have a bunch of apple cores, lettuce that bolted, egg shells, vegetable stems, old dried out cheese scraps, or even meat scraps trimmed off a roast all thrown in the bucket that got dumped in the field? Everyone wins! No one particularly cares for the fresh-roasted-and-ground used coffee grounds, but those residuals nourish the ground and back to the point, it’s a hoot to watch all the critters vie for the “goods”! Good point, IPM is very entertaining! 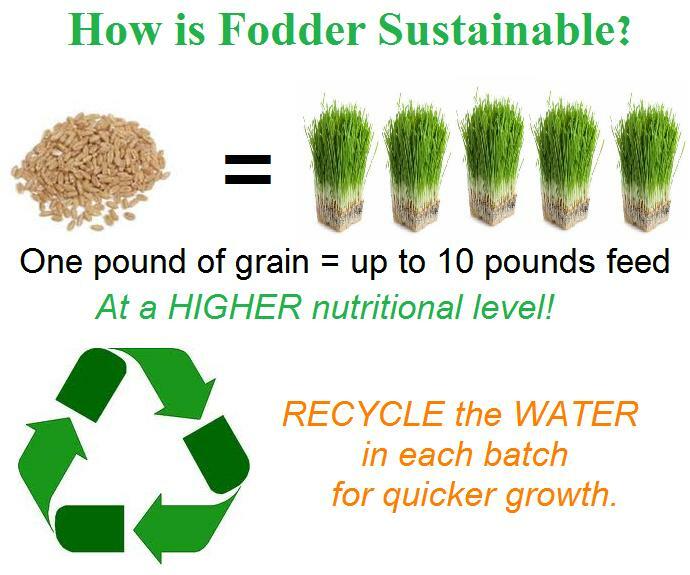 i love the fodder info. got me thinking about next winter. one lb = 10 lbs… why wouldn’t we do that?!!! yes, the pigs love the milk. also, feeding organic grain your hanging weight will be considerably less than conventional. 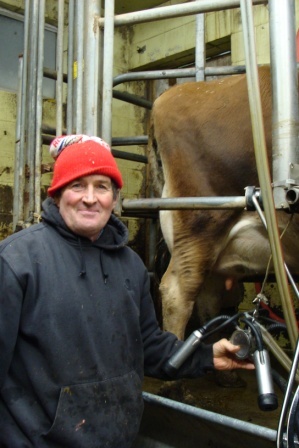 we max out at 200lb hanging and that includes raising them two extra weeks, and we use milk. we know that raising them on pasture, rotating weekly (biweekly in their last month, since they go through the pasture so quickly), feeding organic grains without CORN or SOY and giving them milk makes the tastiest pork hands down! thankful to have our own meat. Thanks for the pig advice, Karen! 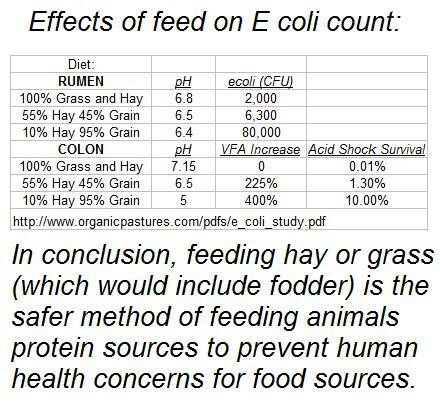 The 1 to 10 pound ratio depends on the feed and how long you let the product grow. Corn takes quite a bit longer to sprout. Barley is a good “starter” seed, as it grows quickly and grows big. I don’t know if this is a good one but on our farm we are trying to integrate Diatomaceous Earth into our animals food to help with intestinal worms and parasites with out the chemicals that later get into your animal by products. Also it helps keep down the flies by killing the larva after they hatch. If you mix it into your grain stock it kills the bugs that would ruin your grains in long term storage. We are currently starting our development of a aquaponics farm integrating fish and plants. I will have to let you know how that goes after we get it fully functioning! Thank you!! Yes, Diatomaceous Earth (DE) is great for humans and pets!! Make sure to ONLY buy the food grade DE and not pool grade DE. Good luck on the aquaponics, that would be something I would love to come see some day! Lots of good hints here, Michelle! Thank you. I particularly liked the info on IPM and on feeding pigs. And, Barry and I are very interested in getting a family dairy cow in about 2-3 years when we move to a small farm — Jerseys of course! We’ll have chickens before that, and I wonder (for future info) — can’t one also feed dairy “remains” like whey to chickens? Have you done that? One area to consider adding a bit of info and a link is biodynamics. If you feed whey to chickens, you could use it to replace their water or to soak their grain. My chickens love cheese beyond all else. They will go nuts for cheese!! As a new chicken owner, I really like the sustainability of chickens. Part of their food consists of kitchen scraps; between that and their being pastured (not totally free-range), we get beautiful eggs. You can tell from the yolks just how much more healthful they are than store bought. And eggshells and chicken manure become part of the compost/fertilizer. For an enjoyable summer / spring evening one can make their own citronella candles. I have a question a pig manure. If I put pig in my garden at the end of the summer to “root” it up, could I plant in the fall or would I have to wait a year? Is there a way to test. Many composters say you should not use pig manure in gardens because of the similarity of parasites between pigs and humans… But I’ve thought the same though about using pigs as a rototiller!! I would say, if you are determined to use pigs then #1 test the for parasites beforehand. #2 if they are free of any parasites then go ahead with your rototilling, and only keep them in there as long as it takes them to root everything up. They’re excellent at eating weed seed and such, and are especially helpful in clearing forested areas. While they are in there, you might daily feed them an herbal dewormer such as Molly’s Herbal’s sells (use the Monthly recipe before they go to the garden, then use the daily recipe after that). My friend raises her pigs using that recipe and she had zero parasites. Proper composting can occur in as little as a few weeks, if in optimal conditions. I would think a garden with good soil would be able to compost the pig manure within a few weeks. Then you could plant. You might check with your extension office if they offer soil testing for human parasites. If so, you could send in a sample and wait for results before planting. Also, you might consider not planting any root crops and just sticking with above ground crops such as lettuce, spinach, peas, etc.